So, today I want to take you behind the scenes of how I developed our new Organic Plant Based Protein Powder. The development process has been brutal. And if I’m being honest with you, I’m disgusted. I’ve discovered that a lot of ingredient labels are LIES. One of the ingredients in the product is pretty common, and many other people use this same ingredient. “This should be easy to source,” I thought. And that’s when I’d discover that their ingredient was BAD. It would fail the tests. I contacted 52 separate sources for the ingredients in our new product. Most of them failed our initial questioning, and the few that passed our initial questions sent over a sample for testing… and each source failed the heavy metals test. None of them lived up to the standards I had set for ingredients at Truvani. You see, our new product at Truvani is an Organic Plant Based Protein Powder, and the ingredient that was giving us the most trouble to source was none other than Organic Pea Protein. This was a COMMON ingredient. For years I fought for change in our food system from the outside. But now that I am creating my own product line, I now see how bad things really are… from the inside. Organic Pea Protein IS common. Why couldn’t I find a clean source? I bought similar Plant Based Protein Powders that also used Organic Pea Protein, and I sent them off for independent testing. When you are contaminated by heavy metals in California, you are required to include a warning label on your product. So I made sure to only send off competitors that didn’t have the warning label. And that’s when I was horrified. One of these competitors had 22x more lead than the “limit,” and they had NO WARNING LABEL on their product. Meaning, they were allowed to have lead in their product, without warning about it, because it was naturally occurring. But come on! Naturally occurring or not. LEAD IS LEAD. I always believed in labels without lies and here’s a big fat lie. As someone who cares about their health, you know you deserve the right to know what’s in your food… whether it’s naturally occurring or not. LEAD IS LEAD! And here, people are granted “special exceptions,” that allow them to sidestep the rules. After all the failed tests, I put our product on hold. Even though we invested a lot in developing it, I coudln’t in good conscious use an Organic Pea Protein that failed the heavy metals test. So, naturally, I was feeling disheartened. I was feeling defeated. But the fact that these other companies would release a product with 22x more lead than the “limit,” without putting a warning label on the product, was maddening. And it gave me the strength to keep searching. I found one unique source for our Organic Pea Protein. The “problem” ingredient that failed so many other tests. This supplier did something different than the other sources. Most suppliers would turn the entire pea – pod and all – into Organic Pea Protein. But this supplier took the pea out of the pod first, and turned just the pea into the Organic Pea Protein. “This is different,” I thought. So, I tested it. And it came out CLEAN. It passed our strict standards at Truvani. And it made our new product possible. Each ingredient was hand-selected by the Truvani team. And we believe they are the best ingredients available. Hands down. And that’s why I’m happy to introduce you to our NEW PRODUCT today. This product almost didn’t happen, but I’m glad I kept searching for high quality, clean ingredients. On the left is our label. On the right is what the label of one of our typical competitors looks like. See how simple and streamlined our label is compared to a typical competitor? We don’t use unnecessary additives. We avoid artificial sweeteners. We don’t use any preservatives. One of the things I’ve always believed is as simple as this: as a producer of healthy products, we should use the least amount of added ingredients as possible. It’s not always about each ingredient being bad. It’s about the fact that sometimes the ingredient just doesn’t need to be in the product, and if it doesn’t need to be there, the company should do its best to eliminate it. With Plant Based Protein Powder as an example, many of these additional ingredients are added to make the product more friendly to the business. It’s not about nutrition. Now, if they were 100% required, and safe, I would understand why it would be okay to use them. But as you can see… they aren’t required… because we spent MONTHS figuring out a simple way to eliminate them. You will not see a Prop 65 warning label on our Plant Based Protein Powder. Because we pass the heavy metals test. We care about our ingredient sourcing, and we don’t need to “sidestep” the rules like these other companies. Mark Twain said it best, “It’s not the size of the dog in the fight, it’s the size of the fight in the dog,” and I know we have the fight in us for so much more. I never set out to create my own product line, but after years of fighting against Big Food, I realized I had no other choice. The only way to make real lasting change in the food system is to fight these companies head-to-head as a competitor. Our new Plant Based Protein powder is vegan. It’s non-GMO. It’s USDA Organic. And it truly passes the strict heavy metals test for Prop 65. 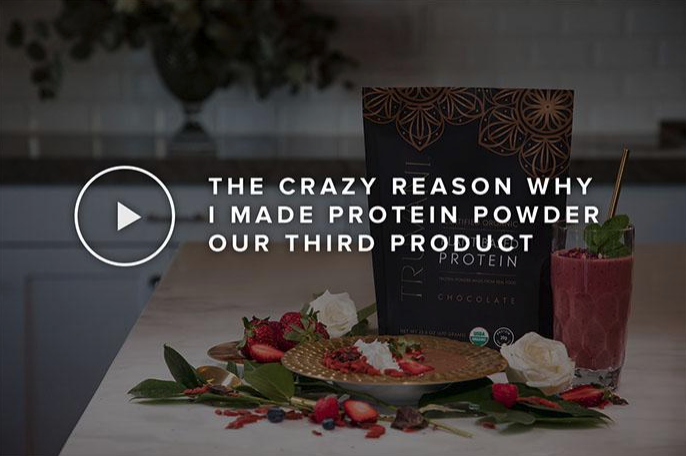 Click this to visit our product page, and WATCH the video to see why I created this Plant Based Protein Powder in the first place. I’ll also share some other delicious recipes that you can make with this product. Over the last few years of fighting against big food, I noticed that calling out specific ingredients and specific companies was playing an endless game of “whack a mole.” No matter how many times I got a company to change, another company would pop up doing the same exact thing as the other companies. It’s crazy. This is one of the reasons why I was driven to start my own product line in the first place. I wanted to create something where people would know that the company did the right thing… from the beginning. So, people would never have to worry about the specific ingredients. With this new mission came additional responsibility. Much of which I’m just as unhappy about as you are. Especially as it relates to specific products I plan to release. But if this is what I have to do to make the lasting change in the food system, so be it. It’s what needs to be done. I know it’s different. For now. But I am working out the kinks, and I assure you that this is what I believe is what the world needs. Good guess… keep them coming! Love, Love your dedication!! I have told my family many times I wish I worked for you! Thank you again for all that you do for us!!! Hi Vani – I have a hunch it is an energy bar. I do/did get some from a well known source – it’s not my favorite. I found another well advertised energy bar I do like with a bit of dark chocolate in it – I am a type 2 – have to read and watch everything. Best wishes with your new line of products. Can’t wait to find out what it is? Protein powder?? Can’t wait to hear what it is. I am thinking protein powder! Please please please have all blogs or videos with subtitles or closed captioned. I’m deaf and I have been following you ever since you started Food Babe. I believe there’s more deaf out there. Trivani instant oatmeal woud be great! I second Peanut butter !! My husband,(now 60) had lead poisoning at the age of 2. He would teethe on his lead painted crib rails and windowsills of his childhood home. His mother knew he was sick from something, but the doctors did not brlieve her until he turned blue. Then he was in the hospital for weeks detoxing. “Go NOW” he would cry continuously to go home. Apparently lead is sweet tasting, so beware those of you that live in old homes! She used to repaint every 6 months routinely to touch up! My horses like to try to eat the paint off my truck if I park in my pasture! And I know other horse owners who have had that problem. I bet that soils near roads have a lead build up just from the days of leaded gasoline. So I was always Leary of veggie gardens near a roadside. Protein powder. If not I hope you come out with that soon! I would guess it’s chocolate. Trail mix, chocolate, strawberry, raspberry, blueberry? My guess is protein powder. I’m guessing rice is the ingredient with the contamination problem. Truvani’s products will be a success because you’ve earned our trust, admiration and absolute loyalty. Looking forward to all of your products, addition to food, I’ll look forward to skin care, cleaning, clothing, ect. I’d wish you lucky, but this is well EARNED from your tirelessly, dedicated work. Thank you for your consistent effort and sharing with the rest of us. I’m hoping it will be black tea. As always super excited for product 3 and super round of your hard work and dedication…. especially as a working momma!! I so admire you! Soy Lichithen? You are awesome what your doing! The food industry is so deceiving and organic is no exception. Keep fighting the good fight! I’m hoping for a protein powder soon because I know “yours” will be fabulous!! I wish you could just say the information you learned vs being so cryptic with super long posts that essentially say nothing. It’s like a commercial for the nightly news….. “this will kill you – learn more about it at 5pm” Is that what your blogs and emails have become? Just a drawn out sales pitch vs actual real helpful information? Cream of wheat & dried fruit is my guesd. Thrilled you’re creating healthy alternatives as Constant detoxing isn’t the optimum way to live. Hi Vani, im really hoping for a probiotic because our gut health is so important! Our gut really determines “who and what” we are. Thanks so Vani. Must have chocolate in it! Vegan, non-gmo, organic Protein Shake? My biggest concern is glyphosate (Round up) weed killer We need some agency to test everything ……I have read about and my have been poisoned by a MRI dye thats now in the news Gadolinium is used in MRI dyes ….It took a few decades to figure out my symptoms and this Dye ….In my search I found nanotechnology is used in making this dye …..I also found nanotechnology is used in other medications and other food processes …..even the gmo foods use this science …..Maybe none of us really know what we are eating ,breating ,drinking ,bathing in or feeding our children …..When its a crime to use safe organic products but perfectly fine to poison everyone …..things need to change .. Many “seniors” think their health degrades simply due to aging. I know better & as a consequence am more vital than most. That said, I dedicate at least 40% of my personal time & resources to partnering with alternative health care professionals & finding/preparing whole organic, clean recipes. Thank you for being part of the “food integrity” solution! Beef Bone Broth I think! Love your new products Vani. Not sure about your new product but I thank you so much for your dedication to a healthier world! You are amazing! I agree with Deborah. I understand your point, very well, but if we knew the ingredient that contains lead in SO many foods, we could at least avoid the foods that contain that ingredient, since more foods than just the type of your product seem to contain it. It’s got to be protein powder!! Can’t wait to hear more about this!! I think it could be a multivitamin. Thank you for ALL you do Vani!!! I’m a long time fan and subscriber, you’ve done extraordinary, trail blazing things and just getting started. Keep it coming, your army has your back! hoping for protein powder because I will buy! I hope it’s not a protein powder. As a society we are eating wayyyyy too much protein as is, and it’s killing us. Plenty of protein in grains/legumes/vegetables/fruits as it. In this country, NO ONE suffers from protein deficiency. Granola is super easy to make and the ingredients are inexpensive, you don’t need to buy it, way too expensive. I’m guessing it’s either salt or turmeric. Ginger? You said its common so it has to be something simple like a spice. I have no idea, but can’t wait to see what it is! I take the Truvani Turmeric every day to help with inflammation. Thanks for all you do to clean up our food supply! God bless you! Protein Powder! I love my Truvani Turmeric and am anxiously awaiting the delivery of my first batch of broth. You are making it very easy for me to make my own delicious trail food. Broth sprinkled in quinoa wtih a turmeric tablet, oatmeal with a turmeric tablet and I put these in small packets to just add boiling water. Can’t even imagine how much better they would be with a Truvani Protein Powder. Hoping my guess is correct, but know I will support whatever product it is. I believe you owe it to your readers to say what product that is that you researched. Exposing harmful products is the reason you have a loyal following. My guess is either bone broth or something chocolate. Hi Tina F Jones, I am deaf, too. By the way, a flour is very common in most food so is that why you found the metals in them? Tumeric is good for you. However, it is not every day for us to eat because it makes your blood thinner. The contaminant common in rice is arsenic, not lead. I don’t know why but I was leaning towards cinnamon??!? Keep it REAL -TRUTH-INTEGRITY =WIN!! I was speaking to someone regarding gluten. I never understood why for so many year there was never a gluten problem, what was going on presently that so many people are sensitive or their digestive track could not tolerate it??? Thats when I had a ah ha moment, GLYPHOSATE!!!!! When Monsanto convinced the wheat farmers that they could get two seasons in on year by saturating the wheat with glyphosate, it kills the wheat fast and they do not need to wait for nature to dry it out. I think the glyphosate is the demon!!! I wish someone could test this theory so the suffering will stop! I believe it is rice as well! Thank you Vani for your courage to fight! I sure hope it’s protein powder. It’s so hard to find a good procuct. I need a vegan healthy protein powder though! Protein powder made with rice protein. Whatever it is, I feel confident it will be the best. Happy to be part of the FBA and look forward to hitting big food where it hurts!! I am in LOVE with food babe – so inspired – she melts my heart and I sincerely wish I could just hug her and look her in her eyes and thank her for her work – no words just overwhelmed with gratitude….what a blessing she is in this world…. I’m going to say, protein powder. My guess is baby food. Children probably don’t have autism they probably have lead poisoning. Protein powder/Meal replacement. If not, I hope you work on that next! Power to the people!! Protein powder! I was just reading an article that tested for heavy metals in ppopular protein powders and very few passed. It was a real eye opener! No matter how hard you try and eat healthy it’s such a challenge. Try doing it as a fulltime rv’er. We are lucky if some of the small towns have a grocery store. Never thought I’d say Walmart was our best friend. They are getting more and more organic products. Now you burst our bubble but I guess if there is money to be made in fake organic food it will be done. Is it an energy drink ? I know a lot of energy drinks even though they claim to be healthly , have a lot of bad ingredients in them. I respect your message and your passion, but are we to go on ingesting these disgusting metal-laden products because you won’t tell us what they are? We don’t have the resources you do, and we need to know. What if we are unknowingly giving this to our children? Please help us and tell us what it is we should be concerned about. Protein powder? juice Plus has protein powder that has “natural occurring lead” and we’re just labeled for prop 65…horrible!! Protein Powder , hopefully, since the Clean Label Project recently tested 134 of the top selling powders sold and found Plant based protein powders tested worst, 75 pct tested positive for lead, and certified organic tested two times the levels of heavy metals (lead, arsenic, cadmium) than non-organic. Well…. the suspense is killing me, share your findings!!!! I am not so concerned with your new offering as I am with the ingredient you found so challenging to find without lead. Would you please share that now with the public? No idea but looking forward to trying your line. Hope it’s not super expensive!! I guess it’s Rice protein! But I hope the company your calling out on is not NutriBiotic. I’ve been using that protein for several years because I couldn’t use soy. Sugar? If so Mexican sugar! I hope it’s baby formula. Is there really any good choice? And since this is being fed to babies you have no choice at all I hope someone comes up with a formula that is the next best thing to Mom. I just really dont see how anything could be “clean” nowadays.. We have constant atmospheric spraying, decade’s of soil contamination due to pesticides, and its just so easy to get by the labels ie. Usda organic and such. My sister just recently got approved for a grant to start her own food product and had people from across the food regulation labeling come and speak with them and its fricken ridiculous how easy it is to bypass a lot of regulations! They just dont have the man power to keep up with these companies and products so a lot falls through the cracks unfortunately…! the main thing that irritates the crap out of me is the fact that NO ONE seems to be standing up to geoengineering which is the biggest concern! Spray the skies EVERYTHING is contaminated! I agree with Tina Jones, subtitles for the deaf is warranted and nerded! If you want an ASL translator let me know, i can make recommendations! Love you and been following you fotever. Just can’t always afford to keep up (on disability). I agree with Deborah. You are changing; how could you (as our Army General), having knowledge of products that make us sick (because of lead), let us continue ingesting them for the sake of monetary gain (it’s really what it boils down too). Starting to lose trust and respect here. I’m going to guess Yogurt. Vani, I’m agreeing with the others that you should at least state the product. E.g., if it’s chocolate that’s a very generic term and I don’t see how you could be held liable. There may be quite a few that are not able to buy your products and you’re thereby doing them an injustice. Something related to tomatoes? Ketchup, tomato sauce, tomato paste or pasta sauce? Or some kind of dried bean? I am so happy that we have people like you. It is unfortunate that the number one thing that should be real and pure to the human body has become such a commercial hoax drama and poison. I feel sad about seeing and knowing that so many people aren’t even educated about their food or have conscious to do so. I truly appreciate your work and dedication to what should already be the first principal of human food. Thank you! Is it the Imposible Burger that I’ve been hearing so much about in the media, lately? I hope it’s protein powder! Hi Vani, I feel disappointed that you are pulling the same advertising tricks, not telling us what is hurting us until you can release YOUR product. Before you created the Truvani line I felt that you had a sincere concern for what we ate and you informed us simply on that basis and this was I listened to you. Now though, it seems pitching your product line is interfering with your genuine concern for what we eat. If that product is in someone’s house right now causing harm, would it be in their best interest to keep them guessing till the 16th? And if the 16th rolls around and they don’t buy your product, will it have served your followers. I might be one of the few feeling this way right now but I think if you continue with this trajectory, you will likely lose your credibility. Please reconsider your approach. I’m hoping it’s protein powder!! But whatever it is… good for you Vani and good for us!! Keep fighting! You are an inspiration and I know You and the Truvani team will make changes happen. So excited to find out what’s next! Not a clue, but excited for the 16th to get here. I could name a bunch but what I read the article for was to find out about the shady products with metals, misleading/ no labels. Sadly I was disappointed. Now I see this article is instead a sales pitch for a new product. If you’re scared of getting attacked and sued by corporations then give the intel to someone else to release and you remain anonymous but don’t follow corporate sales strategies with unfulfilled/ misleading articles in order to promote a new product. Whatever it is hope it help inflammation. Water seems to be more likely as well as vitamin tablets, malt, juice or maybe even something like a dairy product like icecream that kids would love and enjoy also! When I started to follow your fighting against Food Industries, it was because I believed that you wanted everyone to be aware about all the lies and frauds that the Food Industry have done to consumers. However, not sharing important facts you have found in your researches showed that it can be Truvani’s marketing strategy to do as same as what Food Industries are doing, hiding informations. I appreciate the info but are you going to tell us what sources have lead in them or let us continue eating them until you launch your new product? Seems a little unethical to withhold this information in order to build demand and anticipation. No offense, I appreciate what you do but I would like to stop eating lead now, not when your product launches. Protein powder. Thank you for leading the fight! We are all food warriors! @Caroline, there are no tricks. We 100% plan to reveal the ingredient that caused such a headache. We are just giving you a heads up that it will be announced on July 16th. As I mentioned in the article, I have to be extra careful here and I am making sure I have all the “ducks in a row” before I share it. This is one of the reasons why I was driven to start my own product line in the first place. I wanted to create something where people would know that the company did the right thing… from the beginning. So, people would never have to worry about the specific ingredients. With this new mission came additional responsibility. Much of which I’m just as unhappy about as you are. Especially as it relates to specific products I plan to release. I know it’s different. And I agree with you that it’s not ideal. But this is a new endeavor here, and I know we both want the same thing. Right now we are working out all the details for the reveal, and will share more, soon. I’m thinking some kind of tea, as there have been a lot of contamination issues with that. But excited to find out what product you’ll be revealing. Thanks for all you do! Cant wait to hear about your new product. Organic whole grain brown rice should be the most important human food determined to be as clean and pure as possible. All other grains are close to as perfect as rice. Something with chocolate, strawberries, blueberries, raspberries and nuts. Not sure of all the details but I’m excited to see it. Is it spinach or carrot? When I first read this I immediately thought of applesauce which has naturally occurring arsenic – so my guess for this would be peanut butter. WHAT IS INGREDIENT.. DON’T KEEP US IN DARK VANI?? As others have mentioned before me, it seems you are handling your apparent care for us more as people to sell to. What if we were dealing with cancer, had children with ADHD, or care-taking elders with dementia. Wouldn’t it be efficacious to let us know what to avoid? Some of your “army” might also find your products expensive due to financial instability. You are a darling who has found her mission to tackle the big food industry in the name of health. Kudos to you. Although it is long overdue, you seem to be employing some of the same tactics they use as marketing strategies. I also wonder if you are the real author or if it is done by one of the minions in your organization. People out here in the world have been lied to long enough, led to believe one thing versus the truth, and need facts, not hype, for what is safe and affordable. If the item is truly safe, then people will find ways to afford what is necessary for health. So please remember, many of us who are reading your “messages” have interest in their or others’ health. I’m not looking for a sales spokesman. Just the facts. Facts speak for themselves, are black and white,. I can then make my own informed and objective decisions. I’m guessing either an AVOCADO or ARTICHOKE based product. Can you please tell us what this common ingredient full of lead is? Hemp and rice among others are hard to find uncontaminated with heavy metals. So yeah, protein powder. I wish you would have listed the foods to avoid that have metals or lead, please do this in your next letter. I think it’s a protein drink. If the ingredient is ginger, the lead levels can vary widely for each lot number. Will you be testing for heavy metals in every batch? You lose credibility with me for teasing your new product by scaring everyone about this dangerous ingredient. It would be more ethical to release this blog post at the same time you are ready and able to announce the ingredient. This tactic is no better than these food companies, putting profit before our health. What a shame. Your intentions may very well be good but this is the wrong way to go about it and this damages your credibility with me. It just makes me think you TOO will put profit before health. I’m guessing cocoa/chocolate, and I hope you plan to be using lead-free cocoa in a bar that is as tasty as Luna’s Caramel Nut Brownie bar but healthier. Please don’t dilute the most important part of your original mission you’ve started back in 2011. While making us aware of and exposing those who are poisoning our daily food, you have build solid foundation of deep mutual trust and respect that has now become the main pillar of your thriving business. You’ve made great deal of sacrifices, many of them in the area of moral integrity, courage and honesty. Please continue to be our leader, beam of light and spokesman for truth in exposing the corrupt food industry that is poisoning us and our children.. The future success of your business depends on your continued moral courage. Rice. It’s disgusting how much arsenic is naturally occurring in it. Is it a Greens Protein powder? I would hope it’s a purer form of protein powder, but my hope is that it is more specifically a good source of bone broth. My daughter and I have tried several trying to find the best source available since she is a college student and it is difficult for her to make her own while away at school. We finally settled on the a very highly touted bone broth being put out by a very (VERY!!!) respectable person that we have trusted for many years for information and suggestions on our personal health. Even though the cost of this product was much higher than any others we had come across, we felt with the backing of this individual and the trust we had in him it would be worth the cost for our piece of mind in giving her a pure product we could feel safe with. Sadly, my daughter ended up with symptoms of lead poisoning and had to discontinue. She also had marks all over her body that would not go away– until she stopped the bone broth. I was shocked, flustered and saddened that I had agreed to have her consume this and that we were unknowingly poisoning her body with it. I so wish there was something that could be done to establish a level of trust between consumers and food companies. Just so sad. Looking forward to learning what the product you put out is. Thanks for doing what you do Vani! If we are in danger of eating so much lead, I’d like to know immediately, not on July 16th so that maybe I can stop putting whatever this is inside my body. Six days can make a difference. If your mission is to help tour followers get healthier, why string us along? Lead is serious. Why not say “be aware of this ingredient and P.S. look for my new super secret product on July 16th”. This marketing ploy makes me lose trust that you have the health of your followers as a #1 priority. What’s more important, people’s health or your bottom line? Maybe it is a Vani-approved and recommended GREEN Drink with quality tested ingredients?! It’s unfortunate that this is primarily a marketing hook…lead is lead, and your research as an activist & educator offers invaluable info. It also serves to apply direct &/or indirect pressure to healthcare folks, producers, suppliers, regulatory agencies, legislators…(the list goes indefinitely) in an industry that is finally being taken to task. Has benevolence and concern for consumer safety taken a backseat to fattening the bottom line? Clearly you have a HUGE fan base. I have no idea, but I’m excited to find out. 🙂 Thank you for all of your hard work!!!! I trust what you do and say and I’m grateful for your advice!!!! I am also disappointed that you are allowing Big Food to bully you into suppressing the truth. Now you are no different from anyone else, or any other company, journalist or spokesperson out there who has allowed themselves to be silenced. I thought you were different. The love of money is the root of all evil, and now that money is on the line, you are throwing the honesty and transparency out the window that so many people have relied on… in favor of marketing your product. At least that’s exactly how it appears. I hope you find a way around that. It is the Truvani Plant Based Protein. Are there any hints in your photos included in this blog? I spy a bowl of peas. . . I do not understand WHY you cannot name these companies that all have much higher lead levels than is legally possible. It would make what you say a lot more believable. They cannot sue you for speaking the TRUTH! I don’t know, but can TEA please be next!! A good chai tea!!! I’m also deaf. I’d really appreciate if you could provide close captioning on your videos. I’m a huge fan of yours! I have followed you, bought at least one of your books and have sent you followers galore but I, like many of the others who are speaking out, am very disappointed in how you are handling this. It certainly does seem like only a sales pitch and very different from the way you initially handled things. I, too, can’t understand why you would make such a statement and then refuse to say what the product was. If we knew, we could at least choose to quit ingesting it right away or giving it to our loved ones. I am pretty sure it is red wine vinegar ! I remember seeing a warning label on it and decided I did not need it ! Looking forward to your product !!! I hope it a protein drink!! I am also in agreement about the rice/arsenic hypothesis. I undersatand you have concerns about retaliation but we rely on sources like your company who have access to testing, to let us know what is snuck into our food. I’m sad to feel like this was only a promo ad and a big hype into no information about what is hiding in products we may be using. We will continue to try and eat as much home grown and local foods as possible. Plant based protein powder. How can you not tell us what ingredient tests high for lead? As long as you call out an ingredient and not not a brand, I don’t see the problem. We feel tricked that you chose to keep your followers blind. Why should we buy your products if we don’t know the difference. I trust you VANI that’s why I’m buying your products. I’m thinking its something green… A plant. For a superfood supplement. Hoping it is a protein bar, as there is nothing on the market that is any good. I do wish you didn’t have to be so secretive. Its like a big tease and quite frustrating. If you can’t say anything, then please don’t mention anything at all. Did someone guess balsamic vinegar already? I can’t wait to try a truly clean version! Patiently awaiting the reveal. Thanks for your hard work! I’m deaf too.. I’m just like you. I want to stay healthy…I need closed captions or sub-title on all your videos . Sooooo these market strategies are getting really annoying. We all trust you, we all look to you for information and are all willing to purchase your product without creating this weird “hype.” I dunno who the junior marketers are on this case, but enough. As others have mentioned it seems like you are prioritizing profits over our health. Stay true to your base, we are here and eager for more reputable products. The ingredient is probably something simple. My guess is water! Collogen powder? Chocolate? Protein powder? Please inform me of the new product. I think it’s Cacao Powder!!! I love your dedication Vani. I 100% support you! So many things it could be but will guess protein powder or a green drink mix. I’m sure you stopped eating that ingredient yourself and feeding it to your family. You got some bad marketing advice. Please resurrect your integrity. That being said, thank you for the amazing work you do in our corrupt food system. Please inform me, thank you. I know many plant based protein powders contain high levels or lead and arsinic. I use arbonne because its vegan and non gmo and they test raw ingredients and final product for heavy metal contamination. Thank you for all your hard work to keep us informed. My guess is protein powder. Is the new product pasta? I don’t know what this product is, but I know what I am waiting for!!! Protein powder and green juice powder!!! This is frustrating. To keep us guessing when it’s apparent the majority believe it to be protein powder. I’m feeding my children smoothies for breakfast every morning and now worried I’m giving them lead while the suspense is a vehicle used to launch a new product? You’re losing my respect with this game. Almonds, they’re from California. Or wine. Not sure, but whatever it is, I’m sure it’s amazing. Thank you doesn’t quite cut it – you’re doing what we all are looking for – but thank you for all your efforts!! Vani, while I admire all you do and have done I do believe that when you make these discoveries that you present the product so that people and stop ingesting them. To withhold for the sake of launching a new or replacement product sgows me your now in it for the almighty $. Don’t lose sight of exposing these products as soon as you make the discovery, this reminds me of a bait & switch tactic for sales/marketing purposes. Hmmmm chocolate/cacao or baby food? I’ve been following you since the beginning….and it seems you have switched gears. I get it, bottom line you want the best for people!! Before you were trying to change big Corp, but now after learning A LOT, (and I’m sure feeling frustrated) you changed it up and now showing them how it’s done. And, how it can be done ethically & organically. I get that you don’t want your time, resources & energy zapped for silly lawsuits that the Big Corp will throw your way to get you off track, people should give you a little slack here. Funny you can’t please everyone, I’m sure you have learned. Keep up the great work! We are ALL more aware of so much more due to your work!! I think others should try walking in your shoes before they are so quick to judge what you are doing. Soooo I’m not really sure either what you have up your sleeve next…I like everyone’s guesses. Cocoa Powder is known to be loaded with lead. I hope this is it. Can’t find a safe one. I’m a big fan , but what’s with the guessing game? This “tactic” places you on the same level level as so many other internet marketers, and frankly, I find it cheesy. What’s the point ? I still don’t understand why you can get sued for alerting about lead in a common ingredient. It doesn’t seem like a proprietary ingredient since 52 + companies are selling it. It kinda feels unfair to provoke fear about a secret ingredient that is common, and makes me feel uneasy. Is it toothpaste? How about bentonite clay or baking soda? Thank you for all that you do! Protein Powder would be great! Some type of sugar substitute like Stevia or Monkfruit for diabetics or kicking sugar. definitely protein powder, and if not, please make us one, Vani! Is it an energy or protein bar? I have no idea but I’m excited to hear! I can’t wait to find out what the ingredient is. One thing is trying to do the right thing but really changing the world is to think OF the world which includes part of this world who are health conscious, single parents not making enough money to get their own place and want your products for example Turmeric, but way too expensive! Protein powder, plant based! They are always full of heavy metals! Guessing maybe yogurt or “whole grain” cereal~ looking forward to the next BIG “reveal”!! Thanks Vani! I have no clue. It can be any one of the comments already posted. If this is true about all the lies, are we to assume everything we have heard in the past is not true. It would also be good if you would work with the Feingold Assn. We are on the same track. I don’t know what it could be but I am so glad that it’s Vegan!! Thank You!! When are you going to revel the ingredient?????? An antioxidant supplement since it has chocolate, raspberries, strawberries and blueberries. I did not like that you were selling products at first but know am totally on board. If you are a great competitor, that will make them change. Hopefully someone will keep testing for all their lies which will undoubtable still keep coming. I have been hoping a .org would do so. I would support one if so. We certainly can’t look to government to do this task that they should be doing. Please, please, please think about the sustainability of our packaging. With recycling going through major changes, I would love to see you research and use the best packaging for your products as a mission statement and for the well being of our planet. Thanks for all you do. Could it be a meal replacement or healthy shake? Vani, I fully understand what you said in this blog post, the challenges, and where you’re headed, but I’m getting more and more disheartened with the direction in which the Food Babe Army is being led. Lots of folks will have a hard time affording your products, plus those outside the US will have a hard time obtaining them. I believe this new way is benefitting only a precious few. Very limiting. Not like it used to be. How is this keeping up the good fight? It’s not. Dry roasted nuts for use in a protein bar? Regarding the product with lead in it, can you at least tell us if it is a product you have recommend before and what type of product? Then you wouldn’t have to say the brand and we could narrow it down from there. Cocoa powder or possibly an herbal tea. Is it salt? Vani, I don’t know how to thank you for the work you are doing. I went to paralegal school with fighting Big Food and Big Pharma in mind. Somehow, I lost my drive, or was discouraged when I learned that a lot of the attorneys who litigate against Monsanto, et al. are in New York. Being from the west coast, I’m not sure New York would work for me. That’s not the only reason, but I have a small idea of how slow and frustrating it is to change people’s minds about food. I am so grateful to you and all other trailblazers in the ring. I am behind you 100%, when I win the lottery, or at least pull a livable wage… expect support from me. YOU GO GIRL! I’m excited to learn about it! Don’t know but am excited to find out!!! I guess I won’t find out since only the ‘name’ works on an IPad and not the ‘email’ part. Oh well. Can’t wait to hear what it is. I think it is powdered milk because de about your baby drinking milk. salad dressing? it looks like a tall bottle and its surrounded by strawberries….hmmm very curious! keep up the good work we need you! PLEASE let it be clean chocolate! Well, the pic has several strawberries and a couple raspberries and I am NOT happy with what the USDA lets the big company do. The boxes look like luxury chocolate boxes. I’d say protein powder!!! I would LOVE if there was a CLEAN a source of vegan protein!!!! I hope it’s an energy bar that isn’t full of sugars and un-digestible protein. Why is nobody asking…. why does the pea pod itself have 22 times the limit for lead????? That isn’t natural!